To reduce your cost, Brandsport offers this item in Bulk (sold here individually). Gorilla also lists this same item in 4-piece sets as Display Package # 41127BC and Bag # 41127BCB. 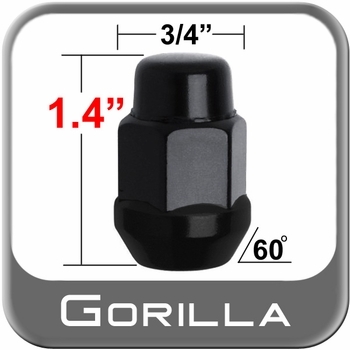 Gorilla Black lug nuts are a perfect factory replacement. Gorilla Black lug nuts are made of heat treated hardened steel. Quick installation and removal is a given with a new set of Gorilla Black lug nuts. Enhance your exterior with new Gorilla Black lug nuts for that finished look.